The Hang Fast T post steel target system is TOUGH and was built on the KISS principle. It is very simple to use with no tools necessary except a hammer to pound in the T post. The hanger slips over the T post and the weight of the target will hold it in place even under heavy fire. The target plate attaches to the hanger without tools by means of a short piece of chain or bolt. The target plate hangs on a back angle to deflect bullet splatter to the ground. The back angle and reactive mounting system divert bullet energy resulting in longer plate life. The plate is extremely reactive when used with the chain making hits easier to spot at long range. The single mounting point enhances plate harmonics resulting in a louder CLANG!! NO WELDS to break or soften the steel. T-Posts are extremely tough and can take a lot of bullet damage which will not affect the hangers performance. Multiple targets can be hung on the same T post as well as large heavy targets such as a full size 1/2" IPSC. 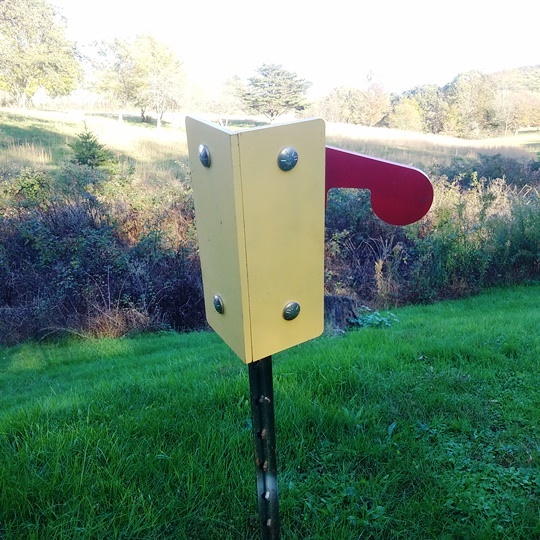 This system is very portable and when the post is set it will stay in place for years. The post can also be easily removed when necessary depending on ground conditions. 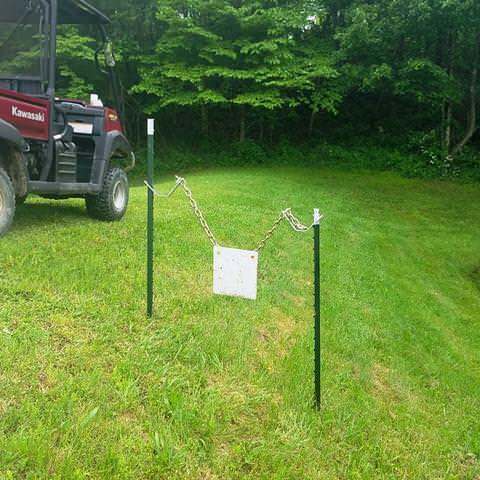 The posts are very inexpensive and can be placed in multiple locations and move just the targets. Very large target plates can be hung using this hanger. Our single bolt mounting system allows greater target movement and louder CLANG! The FAIL SAFE HANGER is designed to work with plates as small as 6 inches when using large caliber firearms. The FAIL SAFE SYSTEM will retain the plate 100% while using the heavy hitters and still remain EXTREMELY REACTIVE. STANDARD HANGER WITH "BOLT MOUNT"
The Hang Fast Standard hanger can also be used with a bolt only. The length of the bolt can change the angle of the target with the longer bolts increasing the angle. Mount your 2 hole plates with our KIT that includes hangers and hardware to mount your plates as shown below. Much more stable than sawhorses and can be mounted on any terrain. Mounting a tire over the plate catches the majority of bullet frags. These frags can be very damaging to surrounding targets, walls or range equipment. Many customers use this system in their indoor ranges to minimize frag damage to the ceiling and lighting. in addition to reducing cleanup. Catch your lead and recycle too! Use the lead for bullets or sinkers. REACTIVE AND RINGS LIKE A BELL ! 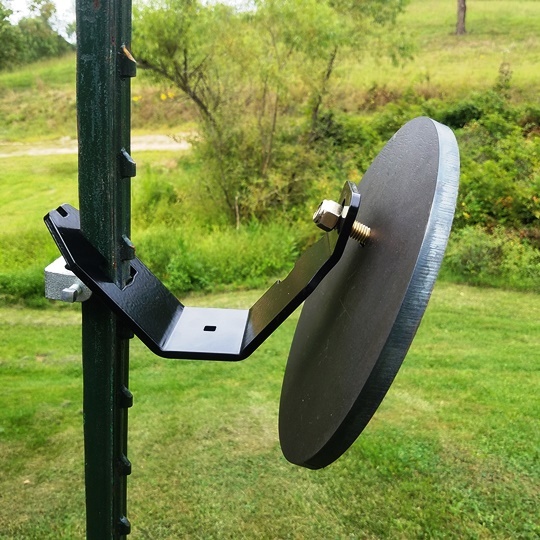 The angle of the target plate can be increased by using a longer bolt on plates 12 inches and larger. Range to the target can be decreased due to the reduction in impact energy. In this video I'm shooting a .223 with frangible ammunition at 15'.